In this article, Jaafar Elmirghani, IEEE Green ICT Initiative Co-Chair, and professor at University of Leeds, examines how IoT’s rise will further challenge our efforts to “green” – or make more sustainable – information and communication technology (ICT). Today, the rate of data generation doubles every 12 months and will soon double every 12 hours. At the same time, IoT machine-to-machine IP traffic will grow 44% each year until 2020. Now, as these digital technologies are being woven into today's Smart Cities, how can big data and the IoT be used for urban analysis? While the Internet of Things offers many benefits, vulnerable IoT devices will put everyone at risk. Recent cyberattacks utilizing IoT devices reinforces why it is so crucial for manufacturers to program basic security measures into their devices. Now, experts in the U.S. are asking regulators to step in. "At this year’s IEEE Technology Time Machine conference, technologists got the opportunity to imagine an ideal future—one in which all diseases have been cured, every country has a stable economy, and telepresence is commonplace. The event encouraged attendees to think big, then step back to figure out how to make lofty goals possible." Forrester's recent report, “Predictions 2017: Security And Skills Will Temper Growth Of IoT”, shares predictions to help CIOs tackle the rapidly changing IoT landscape to deliver and enable connected products and businesses processes. This article from Forbes examines the research firm’s specific IoT predictions for next year. In this article, Doug Zuckerman, chair of IEEE Technology Time Machine 2016, discusses the major technologies featured at this year's conference and singles out IoT as key. The Internet of Things is making its way into more and more industries each day. Nearly 30% of businesses around the world have begun limited IoT deployments, making our world more connected than ever. Where do you see IoT in 10 years? In this article, Clinton J. Andrews examines the social, economic, and political forces that shape the demand for new technologies such as the Internet of Things. Andrews is a Professor at the Bloustein School of Planning and Public Policy at Rutgers University, an IEEE Future Directions and IEEE IoT volunteer, and he will be speaking at IEEE TTM, 20-21 October 2016 in San Diego, CA, USA. An explosion of devices means an explosion of words: the Internet of Things is bringing a new wave of vocabulary. This article from IEEE Spectrum takes a look at a few noteworthy coinages related to the Internet of Things. "Current trends point to the emergence of a fantastic future in less than a decade. Advances in machine learning and artificial intelligence will enable pervasive intelligence in everyday devices to learn and dynamically support our preferences and lifestyles at home, at work and on the move. The still somewhat vague phrase, the “Internet of Things” (IoT), captures this vision." Approximately 2.5 billion people worldwide live directly from agricultural production systems. Since so little is known about small-scale farms, the lack of transparency regarding efficiency of each farm leads to leariness from investors and resellers. However, with frugal IoT, the ability to assess data about these farms may help provide insight into small-scale farming operations. The IoT’s advent has fuelled a paradigm shift in data and context discovery. Datasets that were once confined to single applications are now discoverable and available for reuse and repurposing in multiple applications. Computing Now’s September 2016 issue includes seven articles that examine opportunities and challenges in IoT data and context discovery. "Smart cities, smart grid, self-driving cars, wearable health monitors all have one thing in common – they are likely to link to and depend on the somewhat elusive concept of the Internet of Things (IoT)." "Secure IoT ecosystems require new identity management solutions to cope with new challenges due to the inherent nature and requirements of IoT, where the identities of a huge amount of heterogeneous smart objects need to be managed. Current proposed solutions need to be adapted to the envisioned scenarios allowing more flexible sharing models, as well as volatile and dynamic security associations between entities, while privacy is still preserved, keeping data minimization and unlinkability as main concerns." Payments using near field communications (NFC) technology are getting a boost during the 2016 Rio Olympics as Visa tests using wearables for payments. The Summer Games originated in ancient Greece over 3,000 years ago with the modern Games taking place in 1896 in Athens. Since then, the Games have been at the forefront of technology development and usage. Explore the timeline to see how tech has influenced and evolved with the Games and athletes throughout the decades. View the interactive timeline at IEEE Transmitter. "Integrating sensors into small devices has never been easy, but today it’s even more complex—and more important—than ever before. Thanks to the smartphone industry that popularized sensor applications, consumers and businesses benefit daily from the information sensors provide. Sensors in all types of mobile-connected devices are enabling markets in many vertical industries and fueling the burgeoning Internet of Things (IoT). Camera sensors are essential to autonomous vehicles, for example, and embedded biometric sensors are innovating new medical, health, and fitness products." Learn how the Internet of Things (IoT) is connecting our world in the latest issue of IEEE Spark! Meet an Internet of Things innovator, try a hands-on activity exploring the role of technical standards, check out the IEEE Internet of Things initiative, and discover additional IoT online resources and experiences. In the latest IEEE Brain Trust Blog, Chris Miyachi, chair of the IEEE Cloud Computing Community, and systems engineer/software architect at Xerox Corporation, examines a few key challenges relating to Cloud Computing, IoT, and Big Data such as storage, processing, security, and privacy. Miyachi outlines several strategies and paths to solutions that are currently underway. A new publication from the National Institute of Standards and Technology (NIST) provides a basic model aimed at helping researchers better understand the Internet of Things (IoT) and its security challenges. The National Security Agency has published a special review on the Internet of Things. 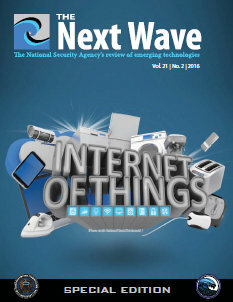 The latest edition of The Next Wave, the NSA's review of emerging technologies, features articles on new innovations, IoT privacy and security challenges, agile block ciphers for IoT, and more. Becky Richards, NSA Director of Civil Liberties and Privacy, is the issue's guest editor. The Internet of Things will be a great driver for memory and storage technology both at the source device and in the network and supports and uses the data from that device. The promise of safe intelligent and autonomous transportation is impossible without significant memory and storage capabilities offered by today’s and tomorrow’s digital memory and storage technologies. Bruce Kraemer, President of the IEEE Standards Association, discusses how current standards development for connected vehicles will help transform the car of the near future from an isolated island of glass and steel to a fully interconnected node in the Internet of Things (IoT). Simple and cheap to produce, a graphene-based photodetector could significantly reduce energy consumption in optical data transmission -- a key achievement in realizing the potential of the Internet of Things (IoT). The LoRaWAN-based system developed by Dutch telco KPN is geared for sensors and other devices with low power and bandwidth requirements. VTT says its micro-supercapacitor is able to compete with carbon- and graphene-based devices in power, energy and durability. Smart devices and appliances have started to infiltrate the kitchen with the goal of making our lives easier when it comes to preparing meals. The engineering of items like multicookers and slow cookers, scales and ovens, strive to bring the future into our kitchens. IEEE member William Webb shares his views on IoT security, noting wireless access points and central servers as main targets for hackers. In Webb's view, the problem isn't in the devices – rather, end-servers are the weakest link, and the spot where the data is hosted is most at risk. 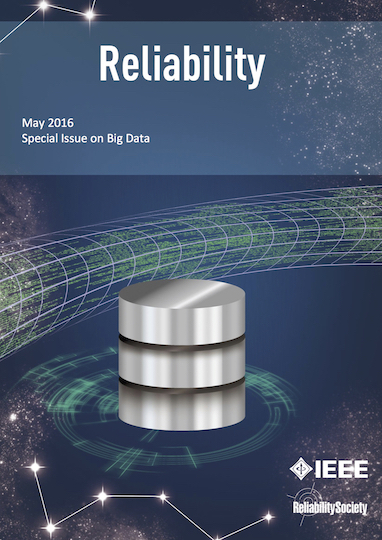 For more information about this issue, please see IEEE Reliability Magazine, May 2016. IoT products are inching their way into our homes at a fast pace. Just as with any other type of consumer product, there are questions about the future of these advanced products. William Webb, IEEE Fellow and CEO of Weightless SIG, an expert on IoT, shares his insight. In this interview, Tom Coughlin, Chair of the IEEE Public Visibility Committee and member of the 2016 IEEE Technology Time Machine Organizing Committee, discusses the top tech trends at this year's CES Asia. In this article, AJ Bubb, Wearables Practice Lead for North America in Accenture Emerging Technology, discusses how we can leverage hands free technology and wearables, such as smart glasses, as a means to equip the field force with the ability to solve problems. AJ blogs regularly about wearables and IoT, and he will be speaking at the IEEE Technology Time Machine conference this October in San Diego. IEEE recently launched the International Roadmap for Devices and Systems (IRDS) to develop a comprehensive, end-to-end view of the computing ecosystem. This article examines how IRDS will affect the computing industry, the challenges ahead, and the program's impact on IoT. This article from IEEE Computer Magazine discusses how IoT can be utilized as part of a disaster emergency response system to help first responders save lives, the challenges of system implementation, and how harmonious standardization is essential to ensure reliable interoperability between the systems involved. In this IEEE IoT Brain Trust Blog, Cicek Cavdar, IEEE Green ICT Initiative, discusses the expanding carbon footprint of ICT, how IoT is forecast to accelerate its growth, and the critical challenges of making ICT more energy efficient, affordable, and sustainable to accommodate these trends. The role of standards is key to providing the needed functionality, interoperability and security for IoT and wearable technology. In this article, Bill Ash, Strategic Technology Program Director for IEEE Standards Association (IEEE-SA), discusses how the IEEE-SA has been working in a number of areas to help build consensus on the adoption of wearable devices. In this article, Steve Carlson, chair of the IEEE P802.3bw 100BASE-T1 Task Force, shares how the IEEE 802.3bw-2015 standard has immediate implications for the connected car, as well as supporting a unified platform for the connected car's future in the Internet of Things. Will Smart Home Technology Change the Way We Live? From smart refrigerators to smart entertainment systems to smart HVAC systems, different appliances and objects are getting smarter and connecting to the Internet and each other. You can expect this technology to further permeate your life in the future, especially at home. IEEE Senior member Arthur Ziviani, IEEE Senior member Yu Yuan, and IEEE Fellow William Webb discuss a number of smart home technologies that will change the way we live. In this IEEE Roundup article from The Institute, IEEE Member and IEEE Green ICT Initiative Co-Chair Thierry Klein addresses readers' questions on how to make devices more eco-friendly as well as the implications of big data and the Internet of Things on ICT's energy efficiency. In this 60 Minutes news report, correspondent Sharyn Alfonsi reports on how cellphones and mobile phone networks are vulnerable to hacking. By exploiting a security flaw in Signaling System Seven, or SS7, hackers can take control of a smartphone just by knowing its number. This article by Bill Ash, Strategic Technology Program Director, IEEE Standards Association, recaps important trends at HIMSS this year and demonstrates how IEEE is helping drive the development of a value-based healthcare system based on standardization and an open, interoperable framework that can integrate multivendor solutions for network optimization and multi-device integration. The Navy Yard in Philadelphia, being an unregulated electric distribution system, independent of the local utility, began with enormous potential and the private businesses, universities and government entities who continue to invest collaboratively are keenly aware of this. By applying technology that is not yet widespread, The Navy Yard has become a testbed for the trends that will become the future of the utility industry. The Bluetooth SIG unveiled their own new energy-efficient specification for Internet of Things (IoT) devices that use Bluetooth communications protocols. This new specification called Transport Discovery Service (TDS) is applicable to devices with Bluetooth Core Specification version 4.0 or later. IEEE Cybersecurity experts are sharing ways to identify and prevent software design flaws. "WearFit: Security Design Analysis of a Wearable Fitness Tracker," a recent document released by the IEEE Center for Secure Design, describes how security flaws in a wearable fitness-tracking device can be avoided. In the latest IEEE IoT Brain Trust Blog, Luciano Oviedo, chair of the IEEE Standards Association Industry Connections' 3D Body Processing Activity, discusses current efforts to explore and develop standards across four 3D body processing technology domains -- of-the-body, on-the-body, fusion, and consumption -- where we expect to see a wide range of benefits. The initiative is helping entrepreneurs present their Internet of Things products to potential investors at events including this year's Consumer Electronics Show. "Recent advances in science and technology, and, in particular big data and the Internet of Things (IoT), provide opportunities to prevent water waste. By gathering detailed measurements and leveraging analytics, it is possible to develop an end-to-end picture of our water supply to safeguard its quality and security." With 10,000 members, the IEEE IoT Technical Community has become the fastest growing technical community created by the IEEE Future Directions Committee. Roberto Minerva, IEEE IoT chairman, speaks with The Institute about the group's success, the challenge to continue to engage members, and efforts to involve industry. Smartwatches, NFC rings, RFID chips... What wearable tech device would you choose to replace your password? IEEE Senior member Kevin Curran shares his insights on biometric security with wearables, including physical and behavioral characteristics. Vint Cerf, vice president and Chief Internet Evangelist at Google Research; and Max Senges, program manager at Google Research, take a look at the challenges and delights we'll find in a future enabled by the Internet of Things. "The term “information age” has been used for decades. Information is data, so by association, are we living in the “data age?” It appears so. Advances in the communication mediums that move information to so many so rapidly enable both." 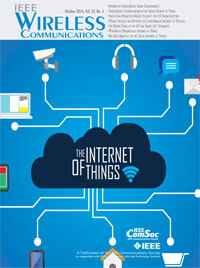 IEEE ComSoc has released a newly designed Infographic on the Internet of Things. They are also offering an intermediate level course, Wireless for the Internet of Things, on 27 April 2016. This course is intended for engineers creating, or about to create, products for use with IoT applications. Check out the Infographic and register now for the online course. A wearable that helps people with disabilities communicate and a kit that helps workers dismantle landmines are among the award-winning devices. "Wi-Fi in 2016 is pervasive already, with over 12 billion Wi-Fi enabled devices shipped to date and 3 billion more forecast to ship this year. Helping to fuel Wi-Fi growth in 2016 and beyond will be the market for the Internet of Things (IoT). A key pillar to enable Wi-Fi is the emerging IEEE 802.11ah specification, which the Wi-Fi Alliance is branding as HaLow." Check out IEEE Spectrum's complete coverage of the hottest gadgets and the latest technology trends at CES 2016, the world's biggest electronics show. "We can trace the current frenzy around the Internet of Things back to technologies presented at ICCE events that stretch back to the 1990s, when always-on, always-connected consumer devices first started appearing..."
Experts forecast the Internet of Things will make progress for the consumer market at the annual CES show in Las Vegas.